Contact us to know more about us and our services. You already use your computer or cell phone to check the weather, view sports stats or pay the bills. Now it's just as easy to stay connected to your home or business while on the go. Make your security system work for you all the time, not just when it's armed. You can be alerted in the event of an alarm, know when the system is disarmed, check in to see which door was opened, or find out exactly what time your kids came home. Unlike traditional systems that do nothing while the system is disarmed, our solutions keep you in touch with what's going on at your property and alert you when something happens. 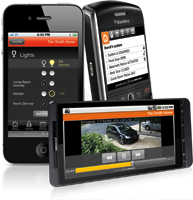 With the app, check system status, review a history of events, arm or disarm your system and receive real-time alerts. Get convenience, awareness, and control at your fingertips. Copyright © Crown Security Inc., 2018. All rights reserved.